Unedogemmula unedo, copyright Eng's Auctions. Unedogemmula is a group of relatively large conoids found in warm waters of the Indo-west Pacific (Powell 1966). 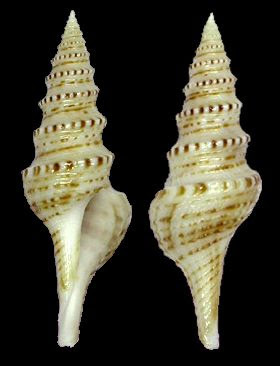 Characters (from Powell 1966): Shell large, 30–105 mm, fusiform, with tall spire and long straight unnotched anterior canal. Protoconch multispiral, narrowly conic, typically smooth of 3–3.5 whorls, terminating in half-whorl of brephic axials, varying to two whorls smooth followed by two axially costate. Sinus peripheral, a deep and narrow slit at the termination of a sinus rib formed of two, sometimes three, sharply raised cords. Coloration plain olive-brown, or with irregularly disposed reddish-brown dots on pale ground to larger maculations and axial streaks. Operculum leaf-shaped with terminal nucleus. Radula of modified wishbone-type, consisting of pair of stout hollow-based conical marginals tapering to sharp point.